PASADENA, Calif. (April 3, 2019) For the first time in its history, the Rose Bowl Legacy Foundation, housed in America’s Stadium, will host a one-day Women’s Empowerment Symposium on Tues., July 9th. Located within a National Historic Landmark, a venue that has housed almost 100 years of admiration and inspiration-filled moments, the symposium will help develop strong, female leaders within the Southern California region, inviting 99 high school seniors and 99 college students to attend. The symposium has been graciously made possible by key philanthropic contributions to the Rose Bowl Legacy Foundation from Carolyn Miller, Mike and Phyllis Hennigan, David and Geraldine Misch, The Ayrshire Foundation and others. This will be a unique opportunity for attendees to hear how female leaders have built their businesses and mastered both the personal and professional balance while providing ethics, services and resources to their community. These sessions will provide inspirational, educational and networking resources all within the breathtaking setting, nestled within the Arroyo, at the Rose Bowl Stadium. A complete list of panelists will be available in the coming weeks and months. The symposium will be a pre-cursor to a marquee event, with the unveiling of the second commemorative statue at the Rose Bowl Stadium, taking place the following day, on Wed., July 10th. Each attendee of the symposium will be invited to attend the dedication of the monument honoring the 1999 Team USA Women’s World Cup Champions. The statue project was funded by multiple groups that will be recognized as part of the project. The Stadium has become synonymous with iconic moments, athletes, sporting games and entertainers. 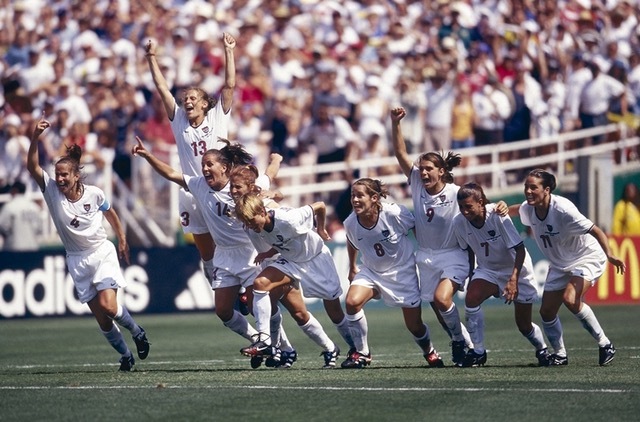 Without a doubt, one of the most iconic moments was the 1999 Women’s World Cup Championship Team who authored a moment that will forever be iconic with female athletics on a global scale. That one moment inspired a global, generation of young female athletes to strive for equality and greatness. Now, with the fast-approaching 20th anniversary of this historic match, in July 2019, the Rose Bowl Legacy Foundation is excited to unveil a statue to recognize this moment forever with Brandi Chastain and Team USA in front of America’s Stadium in historic Pasadena, California. The Rose Bowl Stadium is currently exploring an expansive educational initiative housed within the facility and known as the Rose Bowl Institute (RBI), which the Women’s Empowerment Symposium and other opportunities would presumably fall beneath. It is a goal of the Rose Bowl Legacy Foundation to not just protect and enhance the future of the Stadium, but the future of its community as well. If you are interested in more information or participating in the Women’s Empowerment Symposium and the 1999 Women’s World Cup Statue Dedication, please email legacy@rosebowlstadium.com. The Rose Bowl Stadium is the proud home of the Tournament of Roses’ Rose Bowl Game, UCLA Bruins football, AmericaFest Fourth of July Celebration, concerts including Kenny Chesney, Coldplay, Taylor Swift and U2, international and Premier League soccer matches and the World’s Largest Flea Market. A National Historic Landmark built in 1922 and known around the world, the Rose Bowl Stadium has earned its world class reputation by hosting five NFL Super Bowl games, the 1984 Olympic Soccer matches, the 1994 Men’s World Cup, the 1999 Women’s World Cup, four BCS National College Football Championship Games and the College Football Playoff Semi-Final game. The RBI is the preeminent think-tank promoting the power of sports to unite people. The Rose Bowl Game itself celebrates the athletic and scholarly achievement of its participants and rewards preparedness, sportsmanship and leadership on the field. The Rose Bowl Institute combines the Rose Bowl’s iconic image with thought leaders on the exploration and promotion of leadership, fitness, ethics, and civic responsibility, for the benefit and inspiration of youth and the broader community.